We recently had the pleasure of heading out to the place were the ’90’s are still alive and putting a bird on it makes it cool, Portland, Oregon to tour the Keen Shoes factory and headquarters. 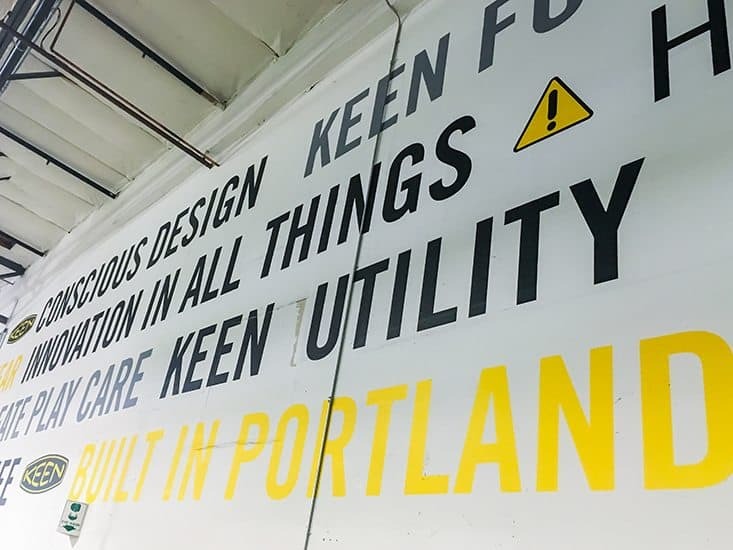 The culture of the Keen family of brands is deeply entrenched in the culture of Portland — not only do their products reflect the multitude of uses your average Pacific Northwesterner may need and want in their daily lives, but they make sure that the place where they began is the place they build up, literally and figuratively. Our main focus was to learn more about the Keen Utility line of products — from how they’re built in a facility right by the 405, to how their range of footwear offerings truly take the safety and comfort of their customer base into first priority, to the company’s commitment to their consumers, employees, and community alike to create quality products that unquestionably improve the quality of life for each and every set of hands that come across a pair of Keen shoes. But truth be told, it was hard to not drink in every aspect of the culture at Keen — the family aspect of the business, the camaraderie of the employees, the creativity encouraged throughout the campuses, and the enthusiastic support of the end result products. And then we actually put a pair of the shoes on. Needless to say, we’re hooked, whether we’re looking for sturdy and comfortable work site footwear or new casual kicks to wear to the park with the kids — and not only because of the shoes. We’ll be sharing our visit to Portland and Keen with you throughout the week, so stay tuned for factory tours, behind-the-scenes peeks, and of course, heavy duty workboots from the inside out, beginning to end … decorative birds optional.